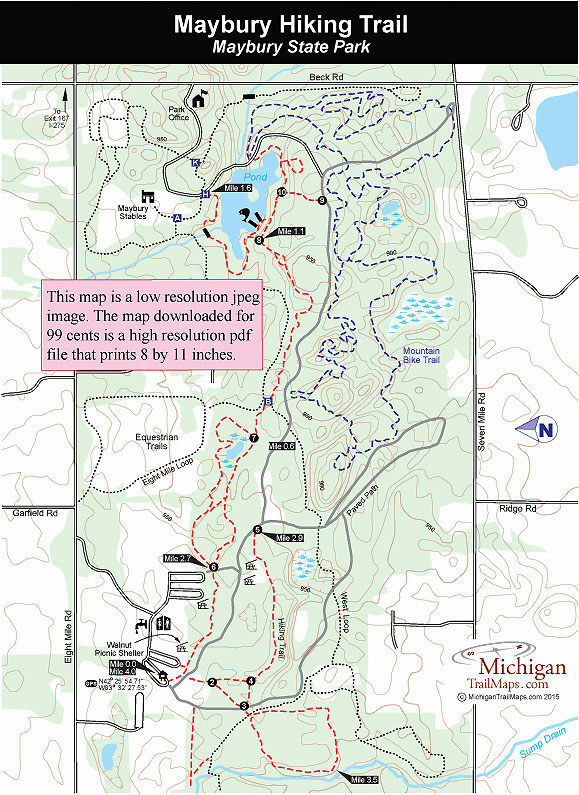 The Maybury State Park Hiking Trail is a 4-mile loop that stretches from one side of the park to the other and can easily be adapted to a 3-mile loop, which still contains the best stretches of trail. You cross other paths and see other trail users – in this park it’s impossible not to – but most of the time you’ll be off by yourself, enjoying the natural sounds and scenery of the rolling woods. Arrive in late April and early May and the trilliums make this a delightful escape from the urban areas and subdivisions that surround this park. The best trailhead to begin at is near the Walnut Picnic Shelter at the west end of the park. Parking, picnic tables, drinking water and restrooms are located here. Despite the myriad of paths in this park, the hiking trail is well marked and mapped at every junction and in between them is marked by green plastic posts with a hikers icon. Near the Walnut Picnic information kiosk look for a wide foot path in the back of the parking area marked with a “No Bikes” sign. This is the hiking trail and immediately passes the return loop, a junction within view of the park’s Paved Bike Trail. Head left to follow the loop in a clockwise direction. The trail is a level wooded walk in the beginning but passes within view of picnic shelters and facilities on one side and the paved path on the other. Within a quarter mile you arrive at post No. 6, cross the paved path and then have a choice on the other side. Head to the right, saving the other stretch for the return. Within a half mile from the start you arrive at a small wetland area with standing water until mid-summer, making it either boutique of wildflowers or a bug factory depending on you’re timing. Pause to enjoy the colors or hightail it out of there. Post No. 7 and junction B are reached just down the trail. This can be slightly confusing as the hiking trail swings right along a horse trail briefly and then resumes east on its own. Again trails are well marked and soon you find yourself following a path through a much more rolling terrain in the woods, a delightful change from the first leg. At one point you’re following a low ridge where you can look down at the paved path to the south and the horse trail to the north. At Mile 1.1 you arrive at post No. 8, located just above the Pond and its massive pair of fishing piers. Follow a short spur to the decks to chat with anglers or head south (right) to continue the loop. You quickly pass post No. 10 marking a spur to the paved path and then use a pair of long boardwalks to skirt the south end of this man-made impoundment. If it’s a quiet summer evening you can watch bluegill and other panfish pick insects off the Pond surface like trout. At Mile 1.4 you arrive at the park road where on the other side is a trailhead for the mountain bike system. 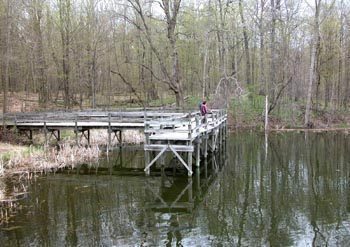 Head north (left) and follow the park road for a quarter mile before dipping back into the woods at junction H. The hiking trail quickly descends to cross a foot bridge over a stream and then skirts the west end of the Pond, a scenic and quiet area that has prompted two people to place benches here. You’re almost halfway through the loop; sit a spell and nibble that power bar. You return to post No. 8 at Mile 1.8 and backtrack to post No. 7, reached at Mile 2.3. This time you can the follow the trail that heads north of the small marsh area before returning to post No. 6 at Mile 2.75. To turn this hike into a 3-mile loop simply backtrack the first leg to return to your vehicle at the Walnut Picnic Shelter. For the 4-mile loop you would head south (left) on the paved path to post No. 5, reached at Mile 2.9. Here the hiking trail heads west by first following an old sidewalk through a grassy meadow behind the Oak and Maple Picnic Shelters and a tot lot. Along the way you pass four historical displays recounting the days when this was the Maybury Sanatorium, treating patients for tuberculosis (1921-1969). A green hiker post marks where the trail re-enters the woods. You skirt a wooded follow and then at Mile 3.2 arrive at post No. 4. Post No. 3 is just down the trail, located at a pair of picnic tables along the paved path. On the other side the hiking trails loops a half mile through a young, regenerated forest before returning to post No. 3. This time head north (left) at the post to return to the Walnut Picnic Shelter within a quarter mile and complete the 4-mile loop. For more information contact Maybury State Park (248-349-8390), Northville Community Foundation (248-374-0200) or Maybury Stables (248-347-1088). There’s also The Friends of Maybury State Park, who provide support to park operations and stage special events throughout the year, including organized hikes and nature programs for children.